"What does the 21st century teacher need to know about digital technologies, and why? And how will their prowess be assessed?" This MirandaMod will address issues arising from this statement. Following on from the success of the first event in November 2011, the MirandaNet Fellowship professional community invites educators to join us, face to face or online, to discuss the role of digital technologies in enriching learning. Policy makers, senior managers, teachers, student teachers will all benefit from participating in these two events. Chris Yapp who is leading the sessions is also researching for his new book, Persuasive Learning, in which ideas from educators at these events will be acknowledged. These events will be held at the Bedford Campus of Bedfordshire University, and will last from 16:30 to 19:30. We are extremely pleased to announce that Radiowaves won ICT Company of the Year (Less than £1 Million) at the 2012 BETT Awards in London. This is a fantastic achievement for Radiowaves and MirandaNet are very proud to be associated with this company. "The BETT Awards are now the standard by which the UK and international education industry can recognise and reward valuable and innovative resources." Christina Preston and members of the MirandaNet team will be on hand in Gallery Room 1 from 11:00 - 18:00 each day. Gallery Room 1 will also be the location of the Live Workshops. The MirandaNet Fellowship with Achievement for All will be running eight Live Workshops or 'Unconferences' with a series of partner organisations. Eight sessions, recorded in several different modes, will lead to the creation of a web-based resource to support teachers entering the second phase of the Achievement for All project. We welcome all contributions related to MirandaNet and invite you to share your photos and short videos. Examples would be MirandaMods, Conferences, and trips and images relating to MirandaNet Research. We always encourage the use of a Creative Commons Licence wherever possible, and always include the MirandaNet tag, please. We have planned a series of MirandaMods for this academic year, the first of which will be held at the University of Bedfordshire on Wednesday 30th November 2011 at the University of Bedfordshire. Further details on the MirandaMods pages. The Achievement for all website has been launched. The Achievement for All pilot programme demonstrated that pupils with SEND have achieved significant improvement. Schools involved in the pilot reduced persistent non-attendance by 20%, and participation in activities impacted positively on behaviour and learning in the classroom. On average, over the first 12 months of the project, SEND pupils improved in reading, writing and maths by over 1.5 National Curriculum sub-levels. The Achievement for All programme will work with schools to support SEND and vulnerable learners in raising their attainment levels, and improving attendance, behaviour, peer relationships and participation in extra-curricula activities. MirandaNet is proud to have been involved in the development of this project. Go to the Achievement for All web site for more information and for a joining form. MirandaNet is proud to be supporting this major event. There are now just a few days to go until the entry deadline for the BETT Awards 2012. Entries have been streaming in from companies wanting to highlight their innovative products and showcase their achievements. MirandaNet Associate Oracle Education Foundation have been running an annual competion for several years now. The ThinkQuest Competition engages students to ssion Development, and several age groups, with valuable prizes to be won! The competition is already open for applications, the entry deadline is Wednesday April 25, 2012, and the winners will be announced on June 20, 2012. 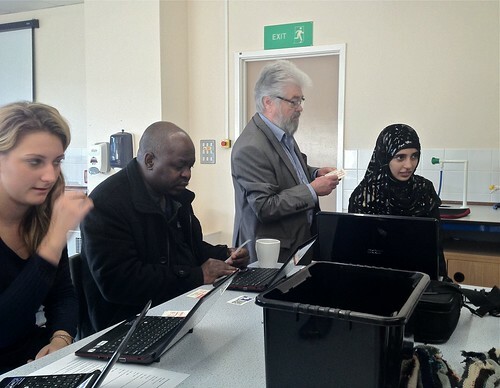 The MirandaNet team also ran the workshops on Thursday afternoon 17th March at 1300, when our topic was'ICT policy and practice in Achievement for All contexts’. In this workshop we paid tribute to what Becta has achieved and did some collaborative thinking about what the ICT community needs to do next. MirandaNet welcomes new visitors. Follow this link for information on how to join the community. All pages on the main MirandaNet site should meet the W3C Standards for CSS and HTML. In addition, we have striven to meet accessibility standards of at least 'Section 508', and ideally WCAG 1.0 Priority 3 or AAA standards. Some MirandaNet pages, including this page and the diary and news pages together with all the the members' profiles and eJournal entries, are interactive and can have items posted on them by members who may not be fully aware of these standards, and thus we cannot guarantee that all pages fully meet our goals. If you spot any errors, or have any comments to make on the accessibility of the site, please get in touch with us using the Contact MirandaNet links below.